The more people we meet, the more traditions we discover, and invent! I have been making themed cakes for my boyfriend’s birthday each year, and it’s a great chance for me to think up a new idea and creation. It’s so easy for us to get drawn into the busyness of work and life, we forget to nurture our fun creative side. 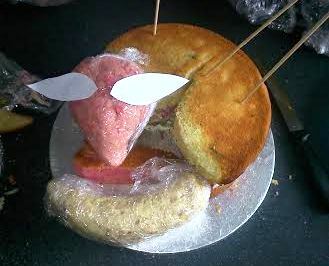 Over the years I’ve made Stewie from Family Guy, Tom Baker’s Doctor Who, the Sussex hills, an owl and a Dalek from towers of sponge and layers of fondant. I give myself the whole day to get immersed in the fun of creating an edible surprise each spring. This year I decided it would be a foxy occasion! What do you think? I was pretty happy with the results! Firstly I baked a few simple vanilla sponge cakes in advance. 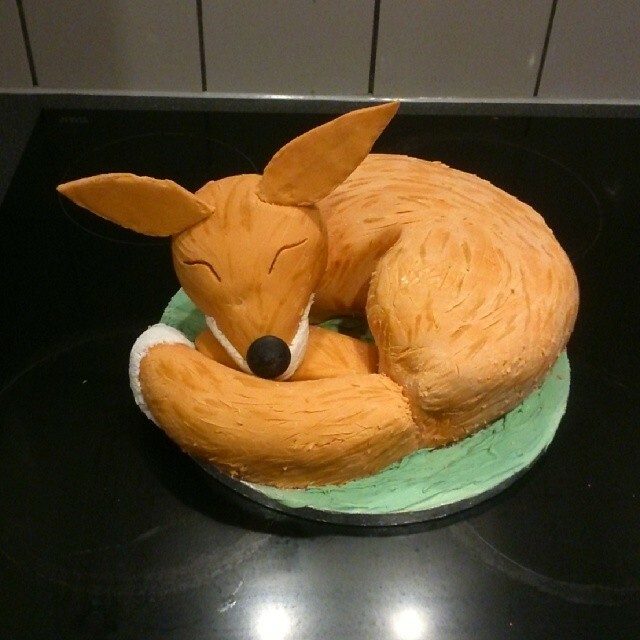 Trust me, it can take the whole day to make yourself a fox, and making some of the sponges in advance and freezing them really helps you get it all done in one day! My favourite, no fuss vegan vanilla sponge cake recipe comes from Veggieful and one batch of this mix makes me one small circle sponge. My boyfriend wanted vanilla sponge, with lots of different sweet things thrown in, so I made some sponge white chocolate and walnut (using Humdinger chocolate drops) and one sponge with some small chunks of Sultans brand Turkish Delight. After I made enough sponge to create the body, and had another sponge for the head, tail and legs I started to carve out the basic fox shape. It helps to draw out on paper the shape of the head, tail and ears so you can lay these on top of the sponge body, to check all the proportions are right. Once the body was cut, I shaped a little bit of sponge for the main bit of his head and then made up some cake pop mix so I had something I could mold into a smooth curve for the top of his head and tail. To do this just break up your section of sponge, and mix in the just under the same amount of frosting. For ease, I used Betty Crocker’s frosting. Once the head and tail were shaped, I chilled them in the fridge for a little to harden them up. It’s such a relief to see some early on look like what it’s meant to turn out as in the end. 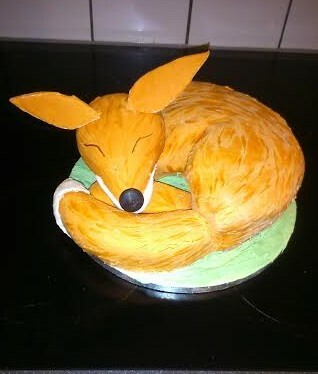 So once all the little bits of sponge came together to form a foxy shape I was very reassured! You can see he looks a little like the poor man on the Ten of Swords tarot cards! These are kebab skewers and so useful in keeping sponge to hold its shape. 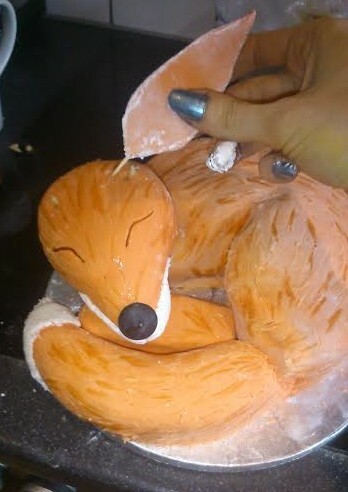 Then I covered my fox in orange fondant. In the end after lots of unsuccessful searched for a new vegan/vegetarian red dye (my current one stinks!) I bought some pre made red Renshaw fondant from lakeland and kneaded in some plain fondant and a gradual mix of yellow and brown. Getting there! 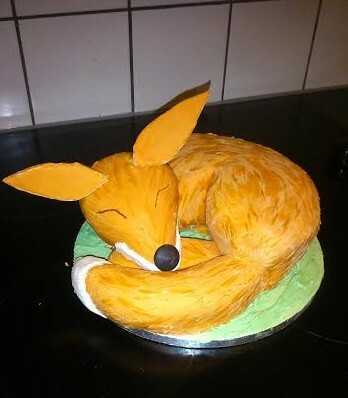 Then I took a knife to it, scratching into the fondant to give it a more furry texture, hoping I hadn’t ruined it at the same time! I also shaped some eyes and painted with a brown and orange mix of dyes some extra fur details. 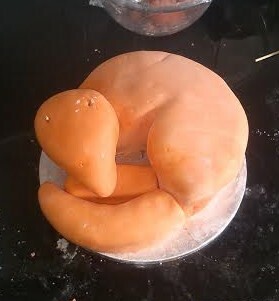 Then I added some white fondant to his mouth and tail and textured that in the same way as the body. I created some ears by rolling flat the orange fondant, cutting out the shape with a craft knife and using cocktail sticks to make the ears more steady and hold themselves upright. I also added a nose with a dark chocolate button. Now just for some grass to be piped on around him, his ears to be fixed on, and complete! Good enough to eat right?